Summertime is one of the most popular times of the year to move in New England. Not only is the weather just beautiful, but the children are mostly out of school for the year, making it easier for families to make local and long-distance moves. If you are doing a complete household move, you should look into hiring services for residential moving and storage in Massachusetts. There are several moving companies near Falmouth, but none with the experience of Plymouth Rock Moving & Storage. Whether you are staying in the New England area, moving halfway across the country or planning international moves from the Cape, our team of expert movers and logistics consultants can help you achieve your goals. If you know ahead of time that you will be moving during the summer, make sure to book your move as soon as possible. This truly is the busiest time of year for all of the moving companies in Massachusetts, so if you need to move on a specific date and have no wiggle room, you need to reserve services for local and long-distance moves as early as possible. Interstate moves have more challenges than local, in-state relocations, so it is important to contact your movers at least 6-8 weeks in advance. Not all moving companies are created equal. Some companies consist solely of two guys and a truck. Others are designed to be more for high-value moves, catering to corporate and wealthy clients. You want something in the middle, a company that has all the bells and whistles when it comes to services for residential moving and storage in Massachusetts, but without all of the white glove services and big-ticket options that you don’t need. Plymouth Rock Moving & Storage has a wide range of options for you to choose from when planning local, interstate and international moves from Massachusetts. One of the most frustrating and time-consuming parts of planning residential moves, either with or without the help of moving companies near Falmouth, is the packing. You can either hire a professional packing service through your moving company to do it for you or you can take a deep breath and dive right in to take care of it for yourself. If you want to do the packing, make sure to start early. 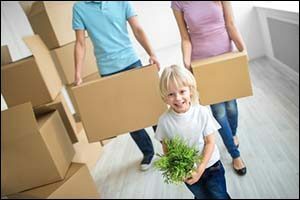 As soon as you confirm that you are moving, start packing up the non-essentials like the holiday decorations, snow boots, and family photos albums. Mark each box carefully so you know what’s inside. Purchase proper packing supplies from the company that is providing your residential moving and storage in Massachusetts. When you hire moving companies near Falmouth to handle your local and long distance moves, take care to read the rules and regulations about what you can and cannot move very carefully. Some regular household items, such as cleaning products, nail polish remover, and propane tanks for your BBQ grill, cannot be moved in a commercial moving truck. These regulations are federal, so it doesn’t matter if you are moving in-state or out-of-state, you’ll need to either dispose of these items properly or transport them in your own vehicle. Ask your moving companies near Falmouth for a list of items that are deemed hazardous and cannot be moved. When the movers arrive, you’ll need to be present. Make sure to go over the moving plans with them again one more time just to make sure that everyone is on the same page. If you aren’t sure about something, refer to your contact for residential moving and storage in Massachusetts to be certain. Your bedrooms should be packed up and ready to go with the sheets, blankets, and pillows off the beds and put away in boxes or linen bags for transport. Allow the moving company to take apart the beds, entertainment centers, tables, consoles and anything else that needs to be disassembled for the move. This is part of the service that they provide. Stay in contact with the agent for the moving companies near Falmouth to make sure that everything is going according to plan. If you are planning local and long distance moves or need to strategize international moves from Massachusetts, contact Plymouth Rock Moving & Storage. As an authorized agent of Mayflower Transit, Inc., we are able to connect our clients with out-of-state agencies to provide complete residential moving and storage in MA and beyond. Give us a call at 1-800-340-0995 to get a FREE estimate on your moving plans or to learn more about the services we provide.